From one of our leading social thinkers, a compelling case for the elimination of nuclear weapons. During his impeachment proceedings, Richard Nixon boasted, "I can go into my office and pick up the telephone and in twenty-five minutes seventy million people will be dead." Nixon was accurately describing not only his own power but also the power of every American president in the nuclear age. Presidents Eisenhower, Kennedy, Johnson, and Nixon each contemplated using nuclear weapons—Eisenhower twice, Kennedy three times, Johnson once, Nixon four times. Whether later presidents, from Ford to Obama, considered using them we will learn only once their national security papers are released. 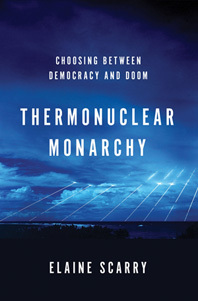 In this incisive, masterfully argued new book, award-winning social theorist Elaine Scarry demonstrates that the power of one leader to obliterate millions of people with a nuclear weapon—a possibility that remains very real even in the wake of the Cold War—deeply violates our constitutional rights, undermines the social contract, and is fundamentally at odds with the deliberative principles of democracy. According to the Constitution, the decision to go to war requires rigorous testing by both Congress and the citizenry; when a leader can single-handedly decide to deploy a nuclear weapon, we live in a state of “thermonuclear monarchy,” not democracy. The danger of nuclear weapons comes from potential accidents or acquisition by terrorists, hackers, or rogue countries. But the gravest danger comes from the mistaken idea that there exists some case compatible with legitimate governance. There can be no such case. Thermonuclear Monarchy shows the deformation of governance that occurs when a country gains nuclear weapons. 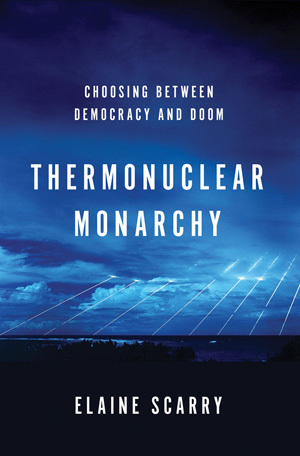 In bold and lucid prose, Thermonuclear Monarchy identifies the tools that will enable us to eliminate nuclear weapons and bring the decision for war back into the hands of Congress and the people. Only by doing so can we secure the safety of home populations, foreign populations, and the earth itself.